Blogging award instructions and help for nominees/nominators! 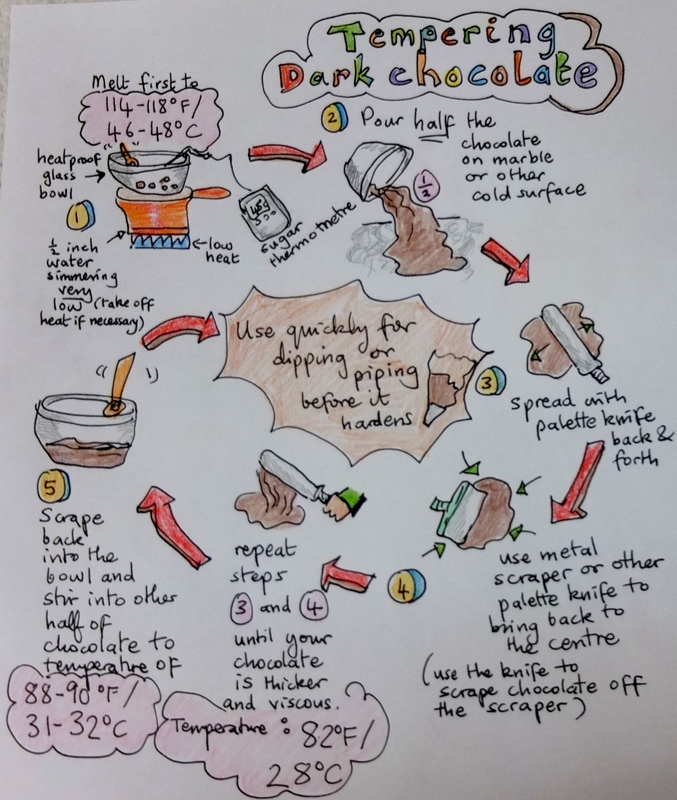 Tempering chocolate – easier with mycryo cocoa butter! Marshmallow fondant recipe – making, covering a cake and painting on it! Inverted or inverse puff pastry recipe – with spelt option! Cake fun: songs, videos, etc. Bergamot and Earl Grey tea! Shrove or fat Tuesday, pancake day! You temper chocolate if you want it to stay shiny and not develop a white bloom with time or in the fridge. So you’d usually temper for decorating cakes or making special chocolates. before you start make sure none of your utensils or the work surface are wet. Water should never touch the chocolate. remember you need to follow the temperature curve precisely. If at any point your temperatures go too high or too low then start the whole process again from the beginning. use a sugar thermometre – it can be standard but probe is better to take the temperature of the chocolate when it’s spread out. The most convenient for chocolate work is the laser thermometre. Use system 1 or 2. I recommend reading the two versions as they both include helpful tips. You can also watch this youtube video, Thomas Schnetzler (Lindt) – How to temper chocolate for some very clear instructions. Insert a sugar thermometre and make sure the chocolate doesn’t get too hot, taking off the heat if necessary (if the chocolate goes over 60°C your chocolate starts losing its integrity). Even off the heat your chocolate will keep melting as you stir. STAGE 3 – bring the temperature of the chocolate back up by adding your cooled chocolate to the remaining half in the bowl (which is still warm). And stir. It must reach a temperature of 31-32°C/88-90°F. If it goes higher than 33°C/91°F then you need to start the whole process again from the beginning. Once it reaches this temperature pour two thirds of the chocolate onto a surface like marble and use a metal spatula to spread then gather up the chocolate. According to Christophe Felder, you should manipulate the chocolate till it reaches a temperature of 28 to 29°C/82 to 84°F. Thomas Schnetzle says it should be cold to the touch and like a chocolate custard. If necessary, stir on the bain marie for 1 or 2 minutes to bring the chocolate back up to the correct temperature (or wait till it cools to the correct temperature before using). Always check with the thermometre. If you’re a few degrees out you won’t get the required shiny snappy chocolate result. Once ready then use immediately and quickly before it hardens! You can tell your tempering has worked if it’s nicely liquid when dipping your chocolates but afterwards your chocolates are hardening rapidly and not staying soft for too long. If it hasn’t worked you need to repeat the whole process. P.S. Apparently it helps if you use couverture chocolate. this was super helpful. I have been intimidated by tempering chocolate, but this makes it seem like an approachable endeavor! Welcome to this site! More cake adventures and recipes for happiness coming soon! Just enter your email address and you'll be notified of yummy new posts by email! Your favourite posts & pages! Small treats – cupcakes, tarts, sweets …! Bliss balls, energy bars, cocoa treats & chocolates! Lovely stuff you guys made from the blog! Yummy wholemeal spelt croissants by Dookes. Very well-shaped and nicely risen too! ‘For a first attempt I have to say I’m pretty pleased. They certainly pass the taste test’ says Dookes. Lovely brioche rolls made by Annette in New Zealand! ‘They turned out really well thanks, my boys certainly enjoyed them, all gone now!’ she reports. But be careful – she noticed that if you don’t use invert sugar or honey but just caster sugar, you’ll need to add a little extra water. Extremely tasty-looking Lamingtons by Annette in New Zealand. Lovely and moist even without cream inside, she reports. So tempting piled up on that pretty plate. Yum! A beautiful orange and rum fruitcake-cake Anglais fruitcake made by Dookes! Looks moist and delicious! Dookes’ comments: ‘seriously good!’ and ‘fantastico’!! You can find the guest post recipe at http://wp.me/p2sQo3-US And Dookes’ cake report is at https://hogriderdookes.wordpress.com/2015/03/18/lilis-biker-cake-made-and-tasted/ on his Hogrider Dookes blog. Scrumptious orange & rum fruitcake-cake Anglais by Stéphanie in Tahiti ‘This cake is just delicious :) I brought one in the office today and it just vanished in a few minutes! Every one loved it :)’ she reports. Lovely local rum, vanilla, honey! A fantastic slice of Apple tarte tatin with Chinese 5 spices and Tamarind by Claudette, aka mum! :) It was very nice and using maple syrup is ‘genius’ she reports. The Pink Lady apples used were ‘lovely, juicy and firm’ and cooked on the ring a little over 10 mins. Plus the pastry browned quite quickly so was covered with foil towards the end. A delicious seed and nut loaf made by Claudette in London. She reports ‘cannot stop eating it … it is really delicious’ And she used more pumpkin than sunflower seeds and a little chestnut flour too.